Week 2 of the One Room Challenge is always the most difficult for me because it's the planning week. Normally I have a general idea on which direction to take my ORC spaces, but this time was not the same. I'm to the point in my Instagram journey where I've found a lot of great (mostly professional) designers that I follow - meaning I get tons of inspiration every. single. time. I'm on the Gram. I got to the point on Monday where I just had inspiration overload and had to stop looking at other spaces. I started with how I wanted the room to feel. Since it's the guest room, I thought of how I liked to feel when I'm staying at someone's house. What did I come up with? Simple and cozy. Feeling simple by keeping decor to a minimum and adding interest through texture so they don't have a million things to look at, only a few key pieces. Make them feel cozy with rich neutrals that lets their mind clear and have an awesome night's sleep. Once I nailed down how I wanted the room to feel, I needed to lay out the key pieces to make it work. Most of you guys don't have access to things like Photoshop and you don't need to. I made it a point with this room layout to only use free, available products you could start using today. My first go-to for product placement is the Houzz app. I only have a basic account and by using the "Sketch" feature was able to import all my photos and virtually decorate the room. You can see in the above picture there is a sketch feature which is helpful when you don't have the perfect product picture. I have this vision for an almost completely white painting that has tons of texture and interest but is very monotone. Kind of like from Daredevil, minus the creepy part about feeling cold. So over the next few weeks I'm going to take one of my canvases and see if I can pull that idea out of my head with my oils. My grandparents love antiques and have given some great pieces to incorporate in our house. I'm hoping to put one of them opposite the bed to give me storage for craft stuff and juxtapose the more modern light and bed frame. This goes to show you that you don't need expensive programs to get your visions on "paper". By virtually decorating you room you can see if colors and/or styles mix. 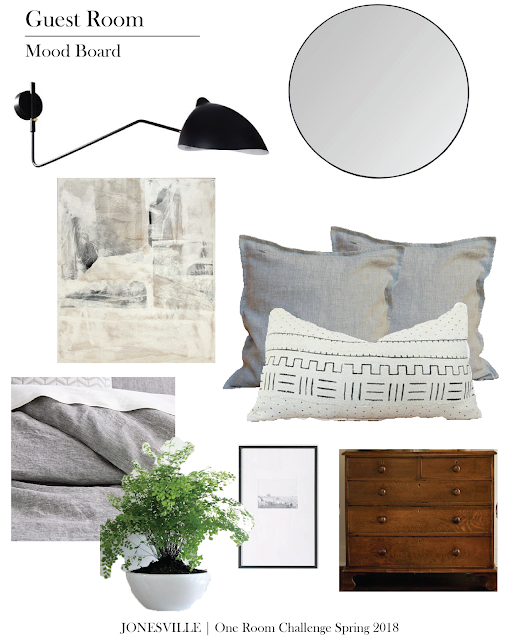 I did take all those thoughts and used Photoshop to put together a mood board that encompassed the products. After making it, I feel much more at ease with the direction I want to take it - which isn't that why there are mood boards?! If you don't have PS, you can 100% do this Word or Google Docs. This next week I'll be clearing the space out, doing an extreme purge of my closet, and doing some major product hunting. I share most the behind the scenes on my InstaStories (@jonesvilleblog) so be sure to catch those. I'll also highlight them in case you miss them! You can see all the guest participant's posts here! As always there are some really great ones. I love the design direction you're going. I'm looking forward to reading next weeks post! Thanks Kalia! It took a lot of restraint to stay with a neutral palette but I think it'll turn out alright! Good luck, What makes Avamar such a great product for Microsoft environments? For starters, Avamar 6.1 has full support for Microsoft Hyper-V. By recover usb drive installing the Avamar software on a Hyper-V server, you can provide backup of the VMs on that server.